A time entry is a record that describes what you were doing during a specific time period. Each time entry has a date, start and end time, duration, and description of what was done. Additionally, a time entry in Clockify can contain a project, billability status, and tags. In Clockify, there are two main ways you can add time entries: using a timer or by adding time manually. You can track time you spend working on tasks using a timer. In timer mode, all you have to do is type description and start the timer, and Clockify will record date, start and end time, and duration automatically once you stop the timer. Enter timer mode by clicking the clock icon in the upper left corner on the Time Tracker page. Type what you’re working on in the “What are you working on?” box. 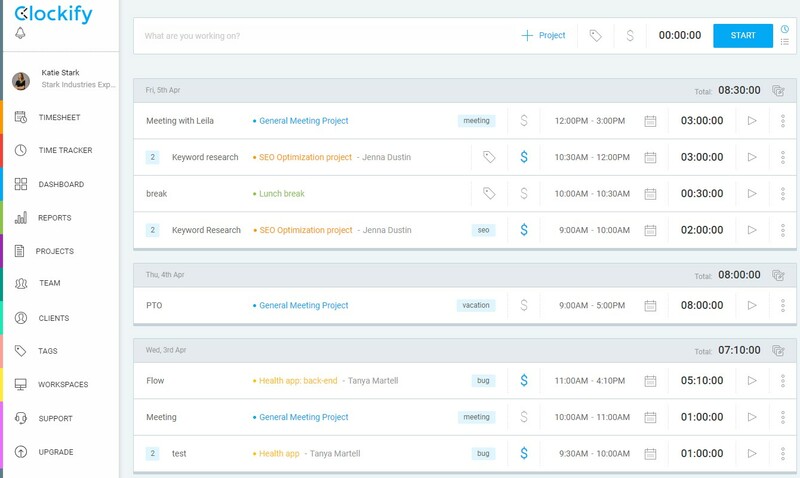 Optionally, mark time as billable, select project/task, and add tags. Start the timer by clicking START button. When you finish working, stop the timer by clicking STOP button. Note that once you start the timer, it will keep running until you stop it; it will keep running even if you leave the page or close the browser. When the timer is running, the favicon in the browser will change from black to blue so you have a visual cue to see if you maybe forgot to start or stop the timer. Also, Clockify will display how long the timer is running in the tab. Keyboard shortcuts can be used on the Time Tracker page and will only work when you are not editing any fields (when your cursor is not active). c = continue latest entry. You can also use shortcuts in Mac app and browser extension. You can change the start time while the timer is running by clicking on the running time. Then you can manually type in your real start time. This is useful when you start an activity but you can’t start the timer at that moment (eg. you’re on a meeting and are away from the computer). Time entries for the same activity (ones that share the same details like description, project, client, etc.) are displayed as a single time entry. Editing the group will edit each individual time entry in the group. You can disable grouping if you wish to see entries in chronological order. 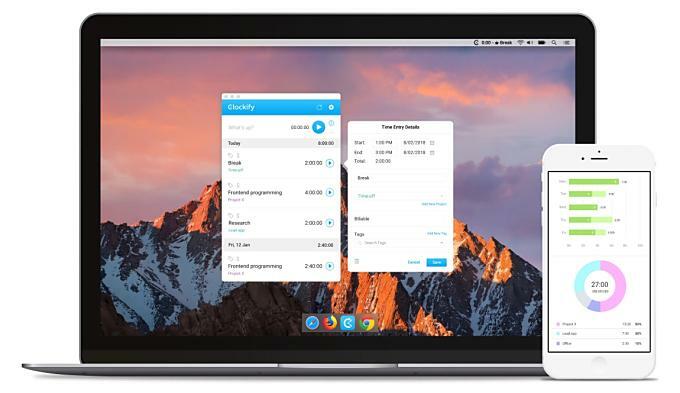 In addition to tracking time the tab in your browser, you can also track time from a mobile app (Android/iOS), desktop app (Mac, Windows, Linux), and browser extension (Chrome/Firefox). By using a dedicated time tracking app, you don’t have to keep Clockify open in a tab all the time. Instead, you can track time from wherever it’s most convenient for you. If you forgot to stop the timer, Clockify can send you an email about a long-running timer (over 8 hours). You can turn on/off that option in your Personal settings. Note: Time entries display the timestamp containing the time zone you currently set. If, when you stop the timer, the time automatically changes to a different time, check your time zone settings in Personal Settings.